Hanns R. Neumann Stiftung is bringing generations together. We are not only supporting in the projects with our partners the social and economic integration of the youth in coffee growing regions. 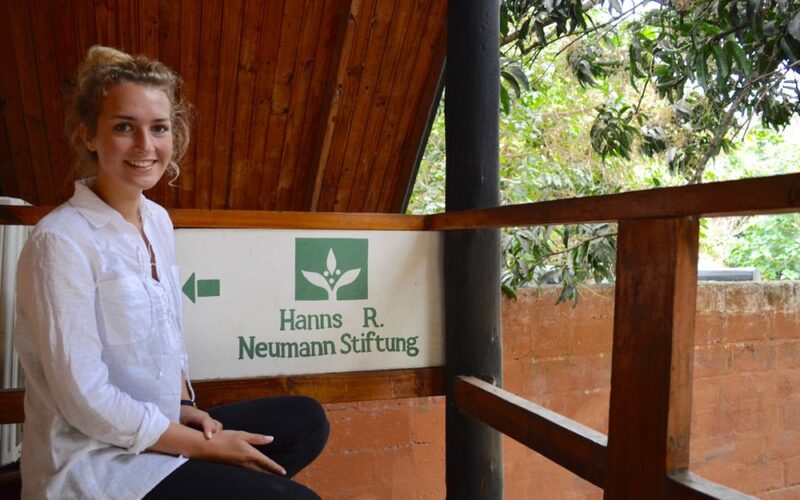 Young coffee drinker Vanessa Sielmann joined our HRNS-Team in Tanzania as intern and got the chance to understand the origin of coffee from a young european perspective. She takes us all to the roots of coffee. Every day worldwide 3.3 billion cups of coffee are consumed. But how much do we who are so utterly in love with this drink know about the origin. Well, at least we all might know that coffee does not grow in capsules. To close this gap in my education my HRNS colleague Godfrey Wilgod took me to two of the Rural Primary Cooperative Societies (RPCS). RPCSs are the second-tier farmer organizations that HRNS is supporting in Northern Tanzania. 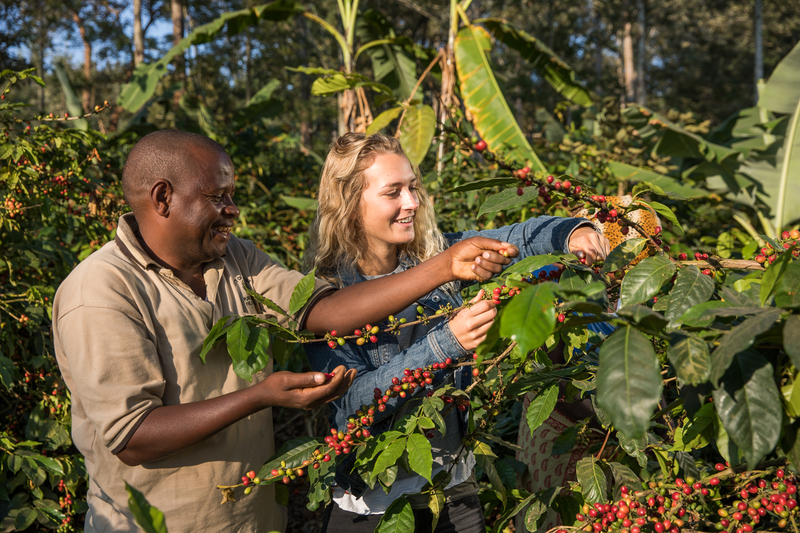 They collect and grade farmers’ coffee and deliver it to the Apex organisation Tanzania Coffee Farmers Alliance (TCFA). TCFA facilitates the final processing and marketing and makes sure that members’ coffee fetches the best possible price at the auction. With every natural product it makes sense to have a look at the plant first. A coffee tree is about 5-7 feet tall and whether it is Arabica or Robusta coffee, the coffee cherry generally looks the same. As growing conditions can greatly affect the quality of the beans the farmers constantly learn new Good Agricultural Practises. The ideal conditions include shade (here it is mostly provided by banana trees), natural mists and even temperature. HRNS is educating farmers in order to sensitize them towards diseases or the adaption of climate change. It is important to monitor the trees very closely since even two or three tiny bugs can destroy a whole plant. As we as the consumers mostly talk about the coffee beans, here at the origin of coffee it is about the coffee cherry. That’s how the fruits are called when growing alongside the coffee plant’s branches. They can be harvested about once a year. When we are travelling in the field I prefer the backrow middle seat – I get the best view and car doors can be quite hard on rural roads. Feeling a bit shaken I am heading to the second step of my tree – to – transport journey: it is all about the cherry. The coffee cherries grow alongside the coffee plant’s branches and can be harvested about once a year. The cherries are ready to get picked when they reach a vivid red colour. The fruits ripen at different rates and have to be picked by hand selecting only the ripe ones. Beneath a thin layer of pulp there is a slimy layer which covers two beans. When the cherries get picked, the pulp must be separated from the beans within eight hours. 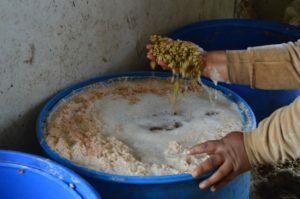 Otherwise fermentation will start and affect the quality of the coffee. The cherries can be processed at home using small hand pulpers or at farmer organisation level using bigger and more advanced machines: Central Processing Units (CPUs). 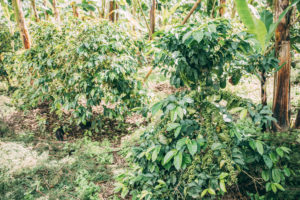 CPU-processed coffee usually fetches a better price as its quality is considered higher and more consistent compared to individually processed coffee. When the farmers have collected about 3-5 bags of cherries they start their CPU. It removes the pulp from the beans with rotating blades. A lot of water is required for this process and the older the machine the more water is needed. This can become a big challenge especially in the dry season when harvesting takes place. If there is not enough water the machine can’t be run and eventually a lot of coffee will start to rot. 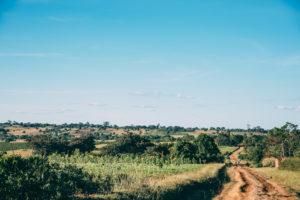 The Initiative for coffee&climate is currently trying to address the issue of water scarcity by promoting innovative, yet easy accessible climate adaptation tools and practices in Tanzania. It is implemented by HRNS. Like everything in life, even coffee beans are not beyond being judged and pigeonholed. The machine grades without mercy according to the size of the beans. The big and healthy ones sink to the bottom of the tank which is filled with water, the lighter ones which might have some insect damage, of course swim. That’s how easy you end up being the bad bean. It is the one that has no room reserved on the drying tables, that is sold for a low price and labelled as the “floater”…Okay, yes. This was maybe a bit dramatic but you get my point. Follow us and Vanessa during the second part of her journey from crop to cup.